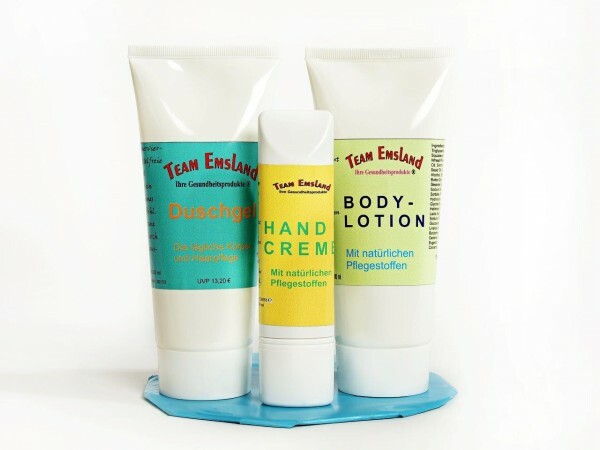 Körperpflegeset bestehend aus unserem "Duschgel", "Bodylotion" und der beliebten "Handcreme" in handlichen 200 ml Tuben und 50 ml Tube. Aqua, Sodium Laureth Sulfate, Cocoamidopropyl Betaine, Glycerin, Glycol Distearate, Laureth-4, Coco Glucoside,Glyceryl Oleate, 1,2-Hexanediol, Caprylyl Glycol, Citrus Aurantium Dulcis Extract, Sorbitol, Propylene Glycol, Sodium Chloride, Polyquaternium-67, Lactic Acid, Allantoin, Parfum, Eugenol, Benzyl Salicylate, Geraniol, Butyphenyl Methylpropional, Linalool, Benzyl Benzoate, Alpha-Isomethyl, Ionone, Isoeugenol, Hexyl Cinnamal. Aqua, Caprylic/Capric Triglyceride, Sorbitol, Glycerin, Squalane, Olivoyl Hydrolyzed Wheat Protein, Persea Gratissima Oil, Simmmondsia Chinensis Sead Oil, Cetyl Alcohol, Cetearyl Alcohol, Butyrospermum Parkii Butter,Glyceryl Oleate, Glyceryl Stearate SE, Panthanol, Allantoin, Sodium Benzoate, Potassium Sorbate, Potassium Hydroxyde,Tocopheryl Acetate, Glycine Soja Oil, Xanthan Gum, Heilmoor Clay, Parfum, Bisabolol, Lactic Acid, Cocoyl Proline, Sodium Carbonate, Coco-Glucoside, Benzyl Salicylate, Linalool, Alpha-Isomathylionone, Butylphenyl -methylpropional, Geraniol, Benzyl Benzoate, Eugenol, Isoeugenol, Hexyl Cinnamal. Aqua, Olivolyl Hydrolyzed Wheat Protein, Cetearyl Alcohol, Glyceryl Oleate, Glyceryl Stearate, Potassium Hydroxyde, Cetyl Alcohol, Sorbitol, Glycerin, Butyrospermum Parkii Butter, Simmindsia Chinensis Seed Oil, Squalane, Cera Alba, Caprylic / Capric Triglyceride, Glyceryl Stearate SE, Cetearyl Alcohol, Panthenol, Xanthan Gum, Allantoin, Tocopheryl Acetate, Glycine Soja Oil, Moorextract (Clay) Potassium Sorbate, Sodium Benoate, Bisabolol,mPrfum, Lactic Acid, Cocoyl Porline, Sodium Carbonate, Coco-Glucoside, Benuyl Salicylate, Linalool, Butylphenyl Methylpropional, Geraniol, Benzyl Benzoate, Eugenol, Alpha-Isomethyl Ionone.